Weekend Commentator Diversion – Do You Play Commander on MTGO? Up until recently, I hadn’t played Magic Online (MTGO). For various reasons I won’t get to now (It’ll go up on my other blog MTGColorPie.com), I kinda stayed away. Finally a couple of weeks ago, I took the plunge. While I don’t play everyday online, it does give me a chance to play when I wouldn’t normally (which is the appeal of it). Long story short, I’m using it mostly for drafting and playing Commander, which is the MTGO equivalent of EDH. I’m still getting the hang of it, but as you can see from the picture on the right, screen real estate is a very valuable thing here; sometimes I wonder why I play on my laptop if people are playing 500 tokens and whatnot. At the moment, I bought the UWG Commander decklist and have been drafting and buying cards through the bots online. I think I have an alright decklist thrown together (was lucky to open several Revised Duals in the ME/ME2/ME3 drafts a few weeks back) but it’s still a work in progress. 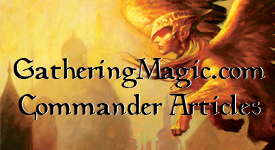 So, for the topic for this weekend/whenever (because people are still chiming in on the other one, which I think is great, continue to do so): Do you play Commander on MTGO? Yes, no, what’s your favorite part, what do you hate, etc? Do you have any advice for people starting out or thinking about getting online? If you don’t play MTGO, is there anything that would get you convinced to try? BONUS: I know that this blog has been lagging a little big, a combination of work and, well, look at the topic, has gotten me a little off track. New posts are currently being written, but I also what to hear from you guys what would you like to see on this site? Is it more decklists, is it strategy, is it theory? I mean I’ve got a ton of ideas (Single card strategies, a best of color/card type segment, etc), but this is about you guys. What would you like to see on here? So comment about one or both. Remember, if you haven’t commented on this site before I need to approve it (it keeps out the spam), and I try to do that as quickly as possible to keep the conversation going. If you’re curious, my name on MTGO is: mtgcolorpie. Find me, friend me (is that how it works? ), and we can play sometime. This entry was posted on Friday, June 25th, 2010 at 12:52 pm	and posted in Commander, EDH, Magic: the Gathering, MTGO, Weekend Diversion. You can follow any responses to this entry through the RSS 2.0 feed. I started playing Commander on MTGO last week and it’s great. My deck has been winning a lot despite being a budget version and strictly worse than my paper version. The most annoying part is resolving all of the triggers that are normally instantaneous with paper magic, passing priority, using activated abilities, and so on. My name on MTGO is norbert88, feel free private message me if any of you are interested in playing Commander, trading, or just chatting. I’ve been playing Commander on MTGO for a yearish or more now, but not very often because I hate going into a room and seeing Horde of Notions, Horde of Notions, Erayo as my opponents. That’s why whenever I want to play Commander I try my best to grab three friends. Screenname is Gardevi on MTGO. In regard to content I’d love to see more decklists, strategy and game reports. I prefer the articles that discuss strategy or deck lists- although theory can be interesting too! The ideas you mentioned though sound really interesting and helpful. I’ve played it on and off since it was coded and I have to say I detest how long it takes to resolve all the triggers. A 30 minute game can take about 2h! I’m playing very little atm until I can build a Damping Matrix/null rod/linvala/Eon Hub/Leyline of the void style deck! No upkeep, graveyards, artifacts or activated abilities. Bring on the vanilla beats! 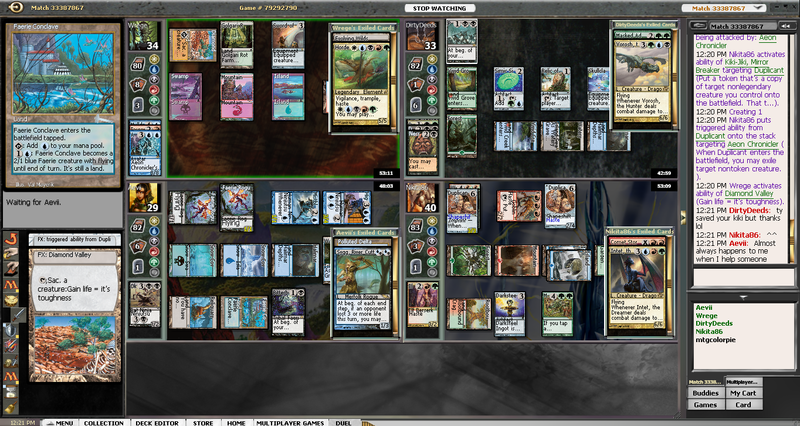 I play Commander online, and I love it! I really like how there are no rules issues, as the client takes care of them for you. In addition you can build pretty good decks fairly cheaply. There are sometimes issues with lag and/or people dropping, but the problems are worth it. I’ve found that the overly competitive Generals aren’t really being played as much, as many times you’ll get a few people that just like playing goofy spells. I also write about the Commander format over at puremtgo.com, so I try to let people know about bugs and other issues. Feel free to add me, my username is Tarasco. Theory is cool. Anyone can build an edh but it’s interesting to see what really makes the builds tick. Id love to see more deck lists and the deck clinics you ran a while ago (one about rafiy). strategy is nice too. Aside from drafting, it’s all I do while I’m online.